Rosenbaum Contemporary is presenting an artist reception and gallery talk for the opening of its Jeff Whyman: All In One Moment exhibition. The public is invited to meet ceramic artist Jeff Whyman and hear a talk by the exhibition’s curator Barbara Paris Gifford, assistant curator for the Museum of Arts and Design in New York. The reception will take place from 6 to 8:30 p.m., April 6, at Rosenbaum Contemporary’s gallery at 150 Yamato Road in Boca Raton, Fla. Those interested in attending can RSVP to rsvp@rosenbaumcontemporary.com or 561-994-9180 x203. The exhibition will remain on view through April 29 during regular gallery hours, Tuesday through Saturday, 10 a.m. to 5 p.m.
Whyman studied under esteemed Abstract Expressionist ceramic sculptor Peter Voulkos, who elevated clay from its traditional function to a new role as a material for fine art sculpture. Unlike Voulkos, who produced his works by adding and subtracting clay over time, Whyman creates his pieces “all in one moment,” throwing large, 20- to 25-pound cylinders and smaller vessels like mugs, bowls and miniature vases on his wheel; cutting chunks, wedges and slabs of clay from large blocks; combining these elements together while still wet; then adding sea glass, Chinese crystals, mineral oxides, metal nails and wood ash in a flurry of spontaneous motion resulting in visually complex works exhibiting rich textural variations and colors once they are dried and fired. Inspired by the geologic transformations of the earth through heating, liquefaction, cooling and solidification, as well as marine creatures such as Xenophoridae, which pick up shells as they travel underwater, Whyman’s work tests the limits of clay, exploring how much it can withstand before it collapses or stiffens. His work is included in numerous public collections including the American Museum of Ceramic Arts in Pamona, Calif.; the Bellevue Art Museum in Seattle, Wash.; the Sanboa International Ceramics Museum in Jingdezhen, China; and the Boca Raton Museum of Art in Boca Raton, Fla. 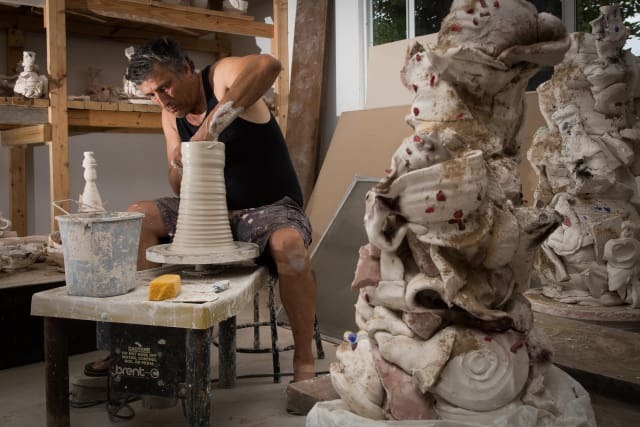 In conjunction with Rosenbaum Contemporary’s exhibition the Boca Raton Museum Art School will be holding two ceramics demonstrations and workshops by Jeff Whyman of his unique process for creating large, expressive ceramic sculptures. The demonstrations will take place on Saturday, April 8, from 9 a.m. to 12 p.m. and 1 p.m. to 3 p.m. Tickets are $10 for members and $15 for non-members and can be purchased at bocamuseum.org/events.